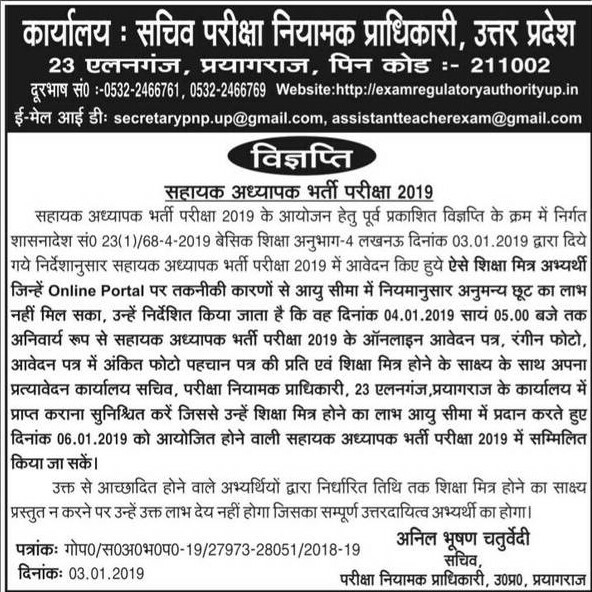 LATEST UP 69000 Assistant Teacher Bharti Update dated 04.01.2019 : Good News !! Shiksha Mitra who are seeking age relaxation, there admit cards will available offline. Read Notice from Image below..
UP Basic Education Department has announced to make Recruitment on Assistant Primary Teacher Posts. 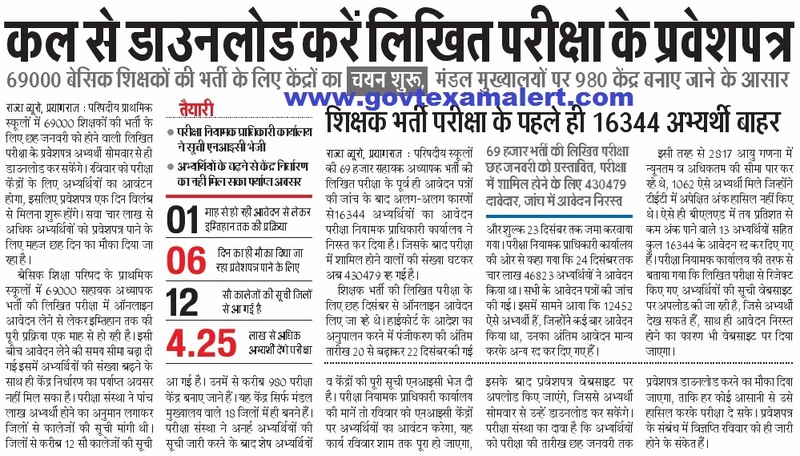 There will be recruitment on 68500 Assistant Teacher Posts, If possible there will be recruitment on more than 95000 Posts (Remaining Vacancies will be added to new recruitment). As per News Written Exam will conduct by exam regulatory authority up. As per Latest News, Written Exam will conduct first. After UPTET Result Declaration Vacancies will be announced for Primary Level Teacher & Upper Primary Level Teacher. Details of UP Assistant Teacher Admit Card 2018 is provided in this Article. UP Assistant Teacher Exam Date : There will be written exam for Assistant Primary Teacher Post in Basic Schools. Exam Regulatory Authority UP will conduct Written Exam. Schedule for UP Teacher Written Exam will announce shortly so keep in touch with us for updates. UP Assistant Teacher Admit Card 2019 : Admit Cards/ Call Letter for UP Assistant Teacher Written Examination will be available on official website. Admit Cards will be available two weeks prior to exam. We will provide Latest Information regarding UP Teacher Written Exam Admit Card 2018. Written Exam will conduct under Offline Mode. There will be 150 Questions in Exam comprises of 150 Marks. This Year UP Assistant Teacher Exam will be Objective Type. There will be Objective Type Questions in Exam. Time Duration for UP Assistant Teacher Exam is 02 Hour 30 Minutes (150 Minutes). 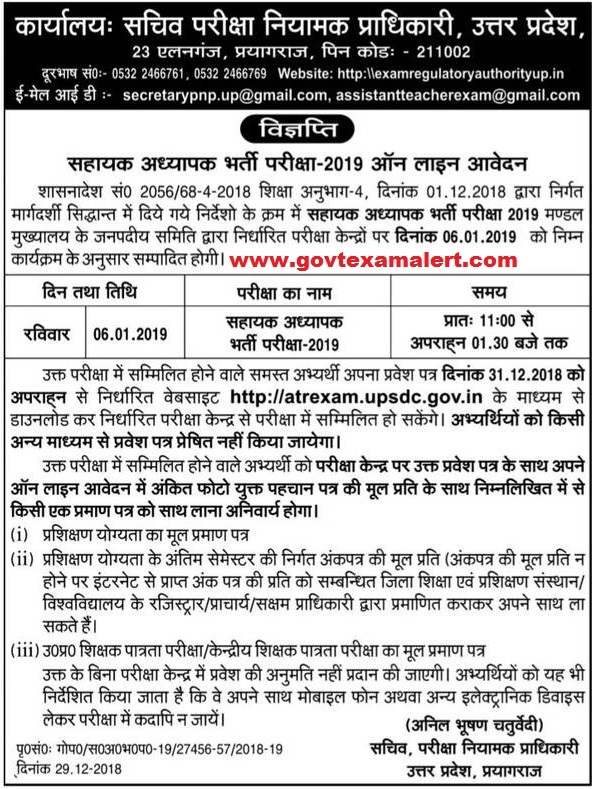 Candidates need to have regular watch on our website & as well as Exam Regulatory Authority’s website to get Latest Updates regarding UP Assistant Teacher Admit Card 2019. You can Bookmark this page by CTRL+D to get latest updates very quickly. You can leave your query regarding UP Assistant Teacher Admit Card 2018 in the Comment Box. We will try to be responsive. Leave an email at Disha@govtexamalert.com for Assistance. Is there anyone jiska admit card download ho paya ho. Tried so many times but unable to download mine. Even sent mail to them but no reply. Phone numbers are busy all the time. can u give your credentials so that i can try to download your call letter ?